This has been an exceptional week of birding here at the Dry Tortugas National Park. Our birdwatchers had an unexpected delight. Among a group of random shorebirds were several Black-bellied Plovers darting here and there at the edge of the shoreline. This striking bird quickly became one of our favorite sightings this week. With its moderately long legs, short bill and neck, long and rounded head, the Black-bellied Plover is the largest plover in North America. While this plover is gray and black on its back, its impressive breeding plumage reveals black from its face to belly. This plover's migration is an amazing journey, usually traveling from the far reaches of Canada's and Alaska's northern most tundras. Arriving starved for the nutrition found along our shores, and like most folks, our standout weather, the plover almost immediately begins scanning for prey. A ground forager, the plover searches for worms and clams sometimes shaking them vigorously in shallow water to remove any silt. Our birders enjoyed watching the plover as it looked for prey by stop-run-stop or stop-run-peck movements and using either a single peck or sometimes a series of pecks on its prize. Interestingly, our birdwatchers caught sight of a tan-colored Willet next to one of the Black-bellied Plovers poking its long bill into the water. The crowd enjoyed watching it doing its bobbing thing, extending its neck upward while looking around, probably for predators, and then resuming its search for prey of small fish, crustaceans, or insects. The Willet actually walked close to us and then flew to another part of the shore showing off his striking black and white wing pattern. He gave us another treat when he allowed us to hear his piercing call. We decided to name the very entertaining Willet our other favorite bird sighting for the week. Willets have long legs and thick, straight bills much longer than their heads. Of the sandpiper family, the Willet's tail is short and squared off, and its wings are rounder and broader than most shorebirds. Often seen alone, the Willet walks deliberately, taking pause to forage. The Willet uses the sensitive tip of its bill to find prey. Since he does not rely solely on his eyesight, he is able to feed both during the day and night. When frightened, he responds with a piercing call, much like that of the Black-bellied Plover, and usually opens his wings and runs rather than take flight. 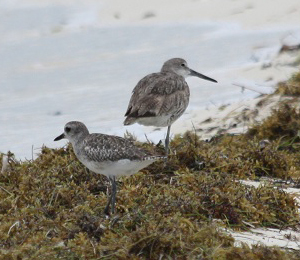 Willet pairs generally stay together for several years and often return to the same nest sites. With such an extraordinary and exciting week at the Dry Tortugas National Park, our birders walked away more than satisfied with their find. Come on out and see what you're missing.